The following guide provides you with an overview of the best free RAM Disk programs for devices running Microsoft's Windows operating system. A RAM Disk, also called RAM Drive or RAMDisk, works in many regards just like a hard drive. The core difference is that it is a virtual hard drive that uses RAM for storage. With it come notable differences born out of that: a RAM Disk is faster than hard drives, and the storage space that it offers is only available during the session unless the software supports the saving and loading of disk images. These traits make RAM Disks ideal for a lot of purposes. You may use it as fast, temporary storage for temporary data. Move the browser cache to the RAM Disk, and never have to worry again about it filling up valuable disk space (as it is only available during that session). You may even install applications or games on the RAM Disk to benefit from faster loading times and less performance related issues while playing those games or using those apps. Another option is to move files that you want to process to the RAM Disk to speed that up. Requirements are simple: the programs must be offered as a free version, and they must be compatible with at least Windows 7 or newer versions of Windows. AMD Radeon RAMDisk is not limited to devices equipped with AMD Radeon hardware. Anyone can download and install the program, and use it to create a single RAM Disk with up to 4 Gigabytes of space. The limit is raised to 6 Gigabyte on systems with AMD Radeon Memory. The program is compatible with all versions of Windows starting with Windows Vista, and supports the saving and loading of the RAM image on start or shut down for persistent storage. The program is created by DataRAM, a company known for its RAM Disk products. The program displays an ad for the commercial versions of AMD Radeon RAMDisk on start. Check out our full review of AMD Radeon RAMDisk here. The resembles to AMD Radeon RAMDisk is obvious. It is more limited than AMD's version, as you may only create RAM disks up to a size of 1023 Megabytes using it. Changes may be saved on shutdown, and you may select to load the saved image on start. 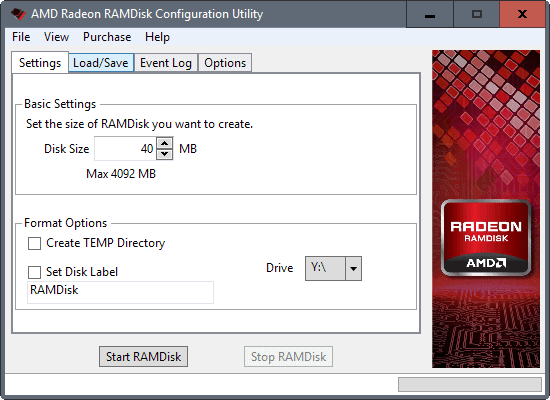 The program lacks features that AMD's version offers, such as selecting a drive letter for the disk. 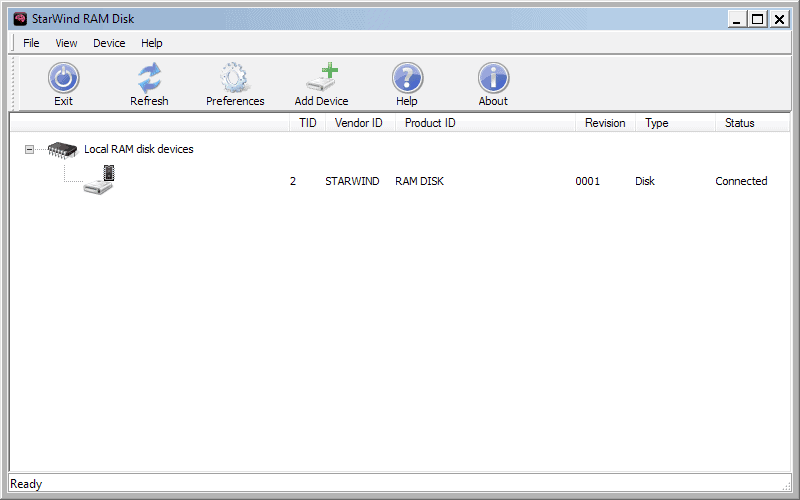 Check out our review of Dataram RAMDisk Software here. Gavotte RAMDisk supports the creation of a single RAMDisk on Windows machines -- XP or newer as well as Server 2003 and 2008 -- with no size limitation. The interface is basic but functional. 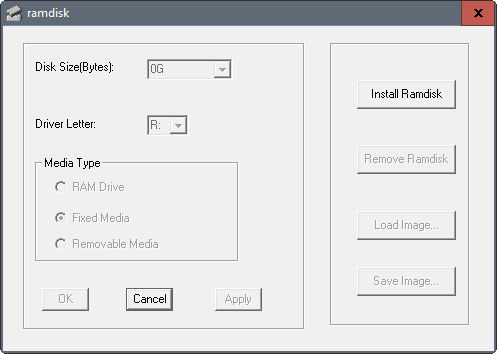 Install and remove the RAM Disk, configure its size, drive letter and media type, and use the load or save image buttons for persistent storage. The program has not been updated in a while though, and does not support Windows 8 or Windows 10 officially. One of the interesting features of ImDisk is that you may use it to create dynamic RAM Disks. Instead of specifying a size during setup, you may check the "allocate memory dynamically" option to have it changed on the fly. 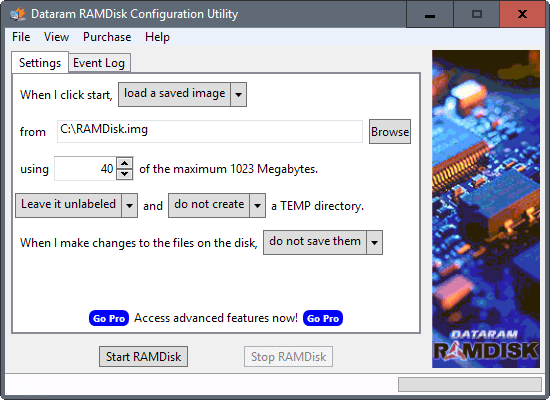 The program does not limit the size of the RAM Disk, and you may use it to create multiple disks. It supports the loading and saving of images for persistent storage options. ImDisk Toolkit offers more than just the creation of a RAM Disk. You may use the program to mount image files as well. 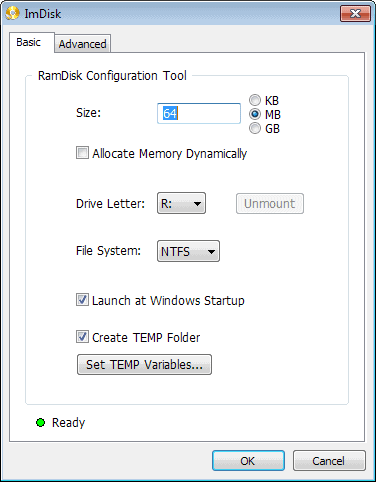 Read create a dynamic RAMDisk with IMDisk Toolkit for additional information. Designed primarily to mount virtual disk images, OSFMount comes with capabilities to create RAM Disks as well. Actually, it offers two options here. First, you may load a disk image file in RAM, or create an empty RAM drive instead. OSFMount supports the creation of multiple RAM drives, and does not limit the size of them. You may select drive letters during setup as well, and may set them to read-only. Data can be saved to image files so that you can load it in the future again. Softperfect RAM Disk is no longer available on the Softperfect website. You may still download it from portals such as Major Geeks though. The program ticks all the right boxes. It does not limit the RAM that you may use to create RAM disks, and you may create as many as you have free drive letters for. It supports the saving of images so that data persists across sessions, a lot of command line switches, file system selection for each RAM disk, and an option to launch programs when RAM disks load. StarWind requires you to create an account on the website before the download link of the company's RAM Disk software is sent to the email account you used to register the account. The program may be used to create multiple RAM Disks that are not size limited. It offers basic functionality besides that however: you cannot assign drive letters to disks, and there is no option to save and load disk images as well. Bond Disk -- The program supports a maximum size of 640 Megabyte. The main purpose of the program is however not the creation of a RAMdisk, but storage for files that hold valuable information. Additionally, it has last been updated in 2010. Read our review of Bond Disk here. Gizmo Drive -- Gizmo drive is part of Gizmo Central, and cannot be downloaded separately. The program's main purpose is the mounting of disk images or encrypted hard drive images. One of the features that it supports however is the creation of RAM drives. You may use it to create multiple RAMDisks that are not limited in size. Program has not been updated since 2011. VSuite Ramdisk Free Edition -- Last updated in 2010, the program is only available as a 32-bit version. It supports a size of up to 4 Gigabytes, and multiple RAMDisks. Also, supports the saving and loading of data on system boot and shut down. The overview and description of each program is certainly helpful in determining the best suitable program for your use cases. I suggest you check out Raymond's RAM Disk Software benchmark to find out how many of these programs perform. If you want to know more about RAM Disks in general, check out the Wikipedia article on RAM drives. On a personal note, I have used SoftPerfect RAM Disk for the past years (the latest free version), and cannot be happier with it. It offers great functionality, and the downside that it is no longer maintained does not bother me as it works fine and without issues. Now You: Do you use a RAM Disk on your system? This guide provides you with an overview of the best free RAM Disk programs for devices running Microsoft's Windows operating system. Still using SoftPerfect RAM Disk on my computers. My Firefox cache is set to go there. My TEMP file location is usually there also, but when I’m running large datasets in certain programs I have to switch it to a HDD. I think he meant his TEMP directory(ies), for other programs than FF. SoftPerfect RAM Disk is still available on their site but it’s not free anymore starting from version ‘4.0’. A free trail can be downloaded though. I use Dataram to create a 350Mb ramdisk (R:\) at boot time, used mainly for various cache and temp folders. I have some junctions in place redirecting app folders to it, and a boot time batch script will pre-fill it with data exactly the way I want it. 350Mb may look small, but in my case it’s more than enough. Never a problem. Funny to encounter Gavotte here, that’s what I used 15 years ago. I use a ram disk to hold the sandbox created by Sandboxie. It is not only more secure, it’s faster to wipe and it does not wear out my SSD when it clears every time I close my web browser or mail client. I’ve been pretty happy with the ROG ramdisk that came with my Asus motherboard. It’s been a very practical tool with my Plex Media Server, speeds up things quite a bit. 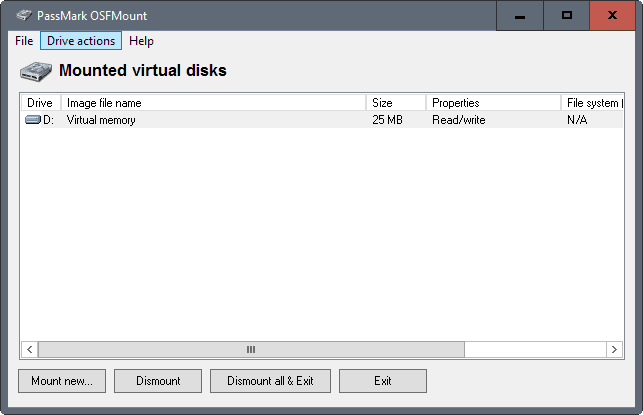 But I like the feature from OSFMount that allows you to mount virtual disks, sounds pretty useful. Broken page here. The banner at the top of the page, with the menu buttons, is turned into text. Colour background of comments is gone. Same thing when disabling NoScript under Firefox, or using virgin versions of Palemoon or Opera. Edit 1 : just publishing this comment corrects the problem. This has happened me once before, and I had deleted my warning comment. I’m leaving it this time, since something obviously is afoot. Edit 2 : under Palemoon and Opera, refreshing the page takes care of the problem. This has begun to happen since changes were announced to the blog interface. Do you load the http or https site? The https site. It seems that https might be the culprit. Under Firefox, I use HTTPS Everywhere. Under Palemoon and Opera (no extensions), the faulty page opened also through https. Not sure how I got there. Probably through a search engine. With Firefox which is my main browser, I get to Ghacks posts through Quite RSS (in case this is relevant). Now the broken page is here again (in Firefox, https). Just refreshing the page (before publishing the comment) does not correct the problem. Under Palemoon and Opera, cleaning cache and everything since ever, then loading Ghacks brings it through http, and the layout is correct. Hitting Submit Comment (under Firefox, https) brings up a warning box : “The information you have entered on this page will be sent over an insecure connection”. I suppose this shouldn’t be the case, since it is, indeed, https://ghacks.net which is displayed in the address bar. Edit 1 : submitting comment “over an insecure connection” publishes the comment, once again, in a page which has now the correct layout. Displayed address is still https. Edit 2 : the difference between the “bad” https connection (with layout broken) and the “good” https connection (with correct layout) is the former has a lock with a yellow warning, while the latter has a green lock. The yellow warning says : connection not secure, parts of this page are not secure (such as images). Edit 3 : once the above comment has been moderated and published, to a correct webpage, just refreshing the page breaks it again. Now displaying the “bad” https connection, with the yellow warning upon the lock next to the address bar. Completely disabling HTTPS Everywhere, giving all permissions to Ghacks under NoScript then refreshing the page does not correct the problem. I may have fixed the issue. Can you please try again, do a refresh (Ctrl-F5), and let me know please? Thanks for reporting the issue. I’m using the ‘Smart HTTPS’ Firefox add-on. Letting it run would make gHacks opened via https. Yesterday I encountered articles’ page rendering broken whilst the homepage was fine, so I ordered ‘Smart HTTPS’ to open gHacks via http only. I’m testing https again and right now all is fine, homepage as well as articles’ pages. This is performed with an empty cache. Hence, I’m removing gHacks from ‘Smart HTTPS’ http whitelist. Https at this time is fluid, renders pages as fast as http, and renders them complete. Everything seems to work fine now, with all three browsers, and different settings in NoScript and HTTPS Everywhere under Firefox. Amazing service ! Thank you ! “There are likely some good uses for RAM disks if you really know what you’re doing. You’d have to be using a program doesn’t normally use RAM as a cache and instead insists on reading and writing small files to your hard drive. You’d have to not care about any of these files and have no problem if you lose them. Chris Hoffman explains it better than I ever could, so . . .
That’s a good reminder. I was surprised to read this article. I thought that RAM disks had gone the way of the dodo, and had been rendered obsolete by modern operating systems as well as the enormous power of contemporary hardware. It seems to me that even when RAM disks were all the rage (would that be XP times ? Windows 95 era ? ), many people advised against them and spoke about snake oil. Maybe there are some specific situations where some very knowledgeable users could still take advantage of such software. I would love to learn more about that. However, for more ordinary users such as me, it’s far more important to know that the important files they are busy creating get regularly saved. If you think it’s being saved to disk but in fact it’s being saved to RAM, this is potentially catastrophic. This is far more problematic than the few milliseconds you might save here and there. If it’s really too slow, buy a faster disk or an SSD. Contradiction welcome. “Maybe there are some specific situations where some very knowledgeable users could still take advantage of such software. I would love to learn more about that. However, for more ordinary users such as me, it’s far more important to know that the important files they are busy creating get regularly saved. Generally, wholeheartedly agree. Most modern, mainstream software will make plentiful use of your ram is need be and its available which negates most RAM disk benefits. And data security outweighs any gains. I have however a niche use case where there are significant benefits. I work as a structural engineer designing buildings. I am currently working on a building where one floor will house vibration sensitive scientific equipment. I am running a finite element analysis model to look at the impact on the dynamics of modifying a number elements and properties. Right now I have 18 models to run, each taking 2-3 hours to run. Turns out the software is fairly niche and as a result its optimisations are far from ideal! The whole thing is mostly single threaded, but can get around that by running multiple instances at once. Next issue is that analysis spends half its time maxing out my SSD at 500MB/s. I could upgrade to an NVME SSD or create an SSD RAID array but given that this is fairly infrequent work, a RAMdisk is ideal. I am shaving 30% off analysis time, and getting a more usable computer for light office tasks while analyses run :). Issue of data loss is also of low importance as I am copying files from network drive and back again when analysis is complete (worst case is a loss of a couple of hours compute time). Nice application !… And really, really specific… beats browsing for kittens on the Web any day ! Personaly I use commercial RAM disks because of the lack od some important features in above free versions like using unmanaged memory for example. SuperSpeed RamDisk and Primo Ramdisk are my favourite ones. For users who need effective RAM disks because of some reasons and free software doesn’t fill their needs, definitely the best choice although it is the paid solution. how those two compare to DimmDrive ? imdisk does NOT limit the number of drives to 1. You are right, corrected. Thanks! When making those comparisons Martin, the RAM DISK speed is also very important. It’s a metric you did not test…. Went to all this work to write this up and not a single benchmark, so sad. You need to use Crystal Disk Mark to get transfer speeds. Not all RamDisks are created/coded with the same optimization, so some are up to 50% faster than others! Hope you can update this article with benchmarks! For example, under Windows 10 Pro and using Crystal Disk Mark 3.0.4 to bench, my favorite, QSoftRamDisk (now WinRamTech) is doing a read/write of 7813/7615. With SoftPerfect RamDisk, I’m getting a staggering read/write of 10586/9404. Running an i7-7700K 4.2Ghz + MSI z270 Titanium + HyperX 8GB DDR4-2400 (1200Mhz). You may want to update the table for column “# of disks” as some of these programs allow you to mount the ram drive to a folder which does not use a drive letter. ImDisk Toolkit is one of these programs. Just look at the advanced tab. I suggest that you consider adding ERAM to this list. It works on Windows XP/NT/2000/7/10 (32 and 64-bit) and has a maximum limit of 4 GB on Windows 7/10 (until I fix the BSODs caused by using a disk that is larger than that after removing the limit). Its driver and source code can be found by going to https://github.com/Zero3K/ERAM. Thank you, I like the free thing!